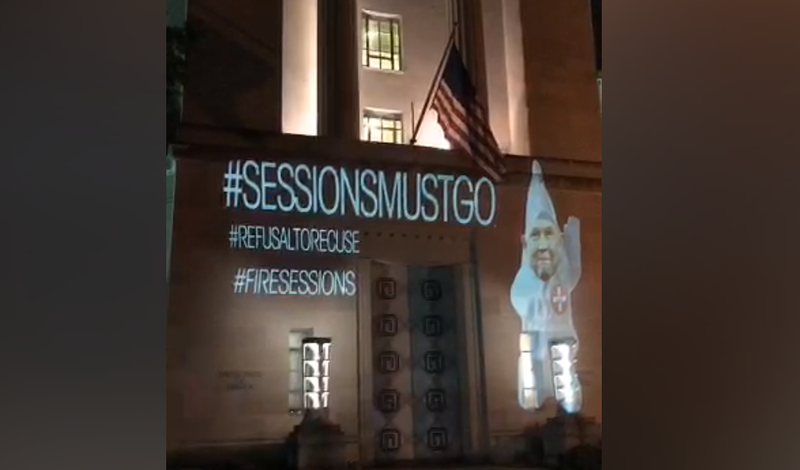 Images of Attorney General Jeff Sessions, including one in which he's photoshopped as a member of the Ku Klux Klan, that had hashtags of "Sessions must go" and "Fire Sessions" were projected on the buildings of FBI headquarters and on the Justice Department Thursday night. Another hashtag read, "We need to see the memo." Robin Bell, a video journalist, tweeted a video clip that showed the images. This comes just a few days after messages were projected onto the facade of the International Trump Hotel in Washington, D.C. at the Old Post Office Tower. Bell was responsible for the projection. The messages read, "Pay Trump bribes here" and "emoluments welcome." The projections on the FBI's headquarters came after Deputy Attorney General Rod Rosenstein briefed the full Senate about the dismissal of James Comey as FBI director the previous week. Rosenstein revealed that he knew President Trump planned to fire Comey even before Rosenstein wrote a memo recommending Comey's removal from the top law enforcement position. Meanwhile, a friend of Comey's, Benjamin Wittes, discussed in a blog post what Comey told them when they had lunch together on March 27. He said that Comey tried to maintain some distance from the White House despite Mr. Trump's demand for loyalty, and he also says Comey was skeptical of Rod Rosenstein before he was confirmed as deputy attorney general.